Back in March 2014, FIVB President Ary Graça resigned from Brazil's Volleyball Federation, the CBV. Graça was the former President of the CBV from 1997-2013. His resignation happened a couple days after ESPN Brazil released a series of articles titled "Dossier Volleyball" identifying corruption inside the CBV. These articles specifically called out Graça and other senior CBV officials for signing CBV contracts with their own companies (marketing agencies, consulting firms, etc.). Graça then issued a statement saying that he had actually resigned three months earlier, and the timing of this public announcement just happened to coincide with these false accusations of corruption. Banco do Brasil, the title sponsor of the CBV was furious and after reviewing the information given by ESPN Brazil, the Brazilian Government ordered the Federal Secretary of Internal Control to start an investigation. This past week, the results of that investigation were made public. The investigation was conducted by the Comptroller General of the Union (CGU). The CGU found that between 2010 and 2013, directors of the CBV spent about 30 million Reais ($11.3M USD) on what they called "questionable contracts". In total, thirteen contracts across that time period had irregularities. Why were they questionable and what was irregular about them? The companies who were awarded these contracts are either owned by or have senior officials with ties to the CBV. This includes contractors who's companies are owned by former CBV senior officials, or are friends and family of current and former CBV senior officials. Two contractors in particular are both sons-in-law to the then CBV President now FIVB President, Ary Graca. Remember when I said Banco do Brasil was furious? That's because it was their money that the CBV was giving away to family and friends. Banco do Brasil in their contract with the CBV, offers athletes and coaching staff a "performance bonus" for great results. This is nothing new, many federations across multiple sports offer financial kickbacks to the athletes and coaches for doing well. The problem here is that it appears very little (if any) of that money actually made it to the players and coaching staff, it was just handed off to friends and family of Graça and other senior CBV officials. Let's take a look at Brazil's results from 2010 though 2013. A few members of the Brazilian national team released statements or did interviews with publications down in Brazil to voice their disappointment with The CBV and FIVB President Graça. Banco do Brasil released statements as well. Coincidentally, after these statements were made, the FIVB decided to issue fines from an incident couple months ago at the 2014 FIVB Men's World Championship. So what was the incident? Brazil missed a press conference, then criticized the FIVB. Missing a press conference is one thing. As a frequent attender of FIVB press conferences, I'm sure not a lot was missed. Did you know it's actually against FIVB regulation to speak out about the FIVB? Oh ya, those fines just so happened to be against some of the players and coaches who voiced their disgust for current FIVB President Ary Graça last week. According to WorldofVolley, The FIVB stated that "fines against members of the Brazilian National [Team] have nothing to do with the FIVB president Ary Graça, or the corruption scandal, because they were brought by an independent disciplinary body". Here's the problem: Who was the FIVB official who presided over these fines? Ary Graça. That is literally the definition of a conflict of interest. Here are the players and coaches who were fined and their respective punishments. If you're going to fine players and coaches immediately after they criticize the head of your organization, you need to be 100% transparent and fair with the punishments. Otherwise your organization looks like you are fining people for criticizing your President. Especially because the FIVB back in September in Katowice said that they nobody would be punished. Why change your mind? It looks like they changed their mind the second anyone was very critical of the FIVB and Ary Graça again. As of the publish date, there is nothing publicly released on the FIVB website discussing their fines of the Brazilian players. The players and coaches then commented on the fines in the media and on their social media accounts. Why did the coach get a bigger punishment? They missed the same press conference. Were all the extra suspended games and extra $1000 for criticizing the FIVB? If so, how do you judge that? Why $1000? Why 20 games? Where are these seemly arbitrary numbers coming from? 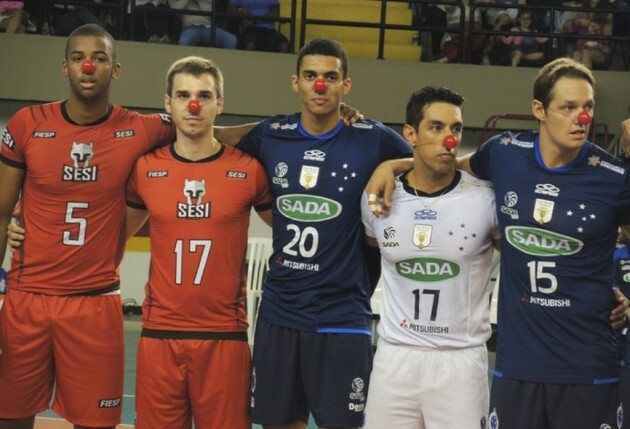 Many players in Brazil had club matches this past weekend and wore clown noses as a protest against the corruption of the CBV and Ary Graça. In the Canoas vs. Funvic match, each team also missed their first serves on purpose as a symbol of their anger. One of the players wearing a clown nose was Canadian National Team Captain Fred Winters. Winters is down in Brazil playing for Sada Cruisero this season. We reached out to him to find out what the players in Brazil were feeling about the recent news. "[The players] are all really disappointed with the federation down here. The clown noses are an act of solidarity for the players. It's something they do in Brazil here [...] for other protests." It does sound like the players are optimistic about the next step of the process. "[the players] are hopeful that they will figure it all out. If they don't figure out who took the money, Banco do Brazil, their main sponsor is gonna pull the funding, so they will have to find a new [sponsor] or even worse they don't have money to run a program." Fred does not think it will come to that. This was not the only protest going on in Brazil. The new leadership at the CBV is angry with Graça and the FIVB for the fines and the money scandal. The new CBV President Walter Pitombo has released a statement saying that they stand behind their players and will be pursuing this more in court. They also said that they will no longer host 2015 FIVB World League Finals. To which The FIVB replied (in a private letter published by Globoesporte) that if they cancel, the CBV "shall pay for all penalties imposed by the Sports Regulation and the Constitution of the FIVB". This is getting out of control. Players and coaches spoke out about the FIVB, so the FIVB fined them after they said they wouldn't. What a classy move. Murillo has also said to Globesporte that he and other players are considering leaving the national team if this doesn't get resolved. It's unclear at this point how many senior officials of the CBV with ties to these 13 companies and this scandal are still at the CBV. It appears that under new leadership they may be taking the right steps. If Ary Graça wants to walk away with any respect from the volleyball community, the obvious choice would be for him to resign. This is embarrassing and a bad mark on the sport of volleyball. The facts are that he oversaw and signed contracts with companies owned and operated by his friends and family. Some of those companies don't even exist at all. All these fines may very well be coincidental, but the timing and logistics the decision just appears shady. The big question is still unanswered: Will the money ever get returned? I'm not holding my breath. We will update this story as more information becomes available. Be sure to keep in touch with us on social media for updates. This past weekend, the Ary Graça & CBV scandal just kept growing and growing. When we wrote this article, the current CBV organization was quite vocal about their desire to pull out of hosting duties for the 2015 edition of FIVB World League. The FIVB said that they would have to face the fines and penalties. This weekend, the CBV told Globoesporte that The FIVB is withholding $1.8M USD from The CBV as collateral for cancellation of 2015 World League. This money was prize money for this year's World League and Grand Prix. National Federations who do well at these international competitions usually get their prize money in December at the end of the calendar year. The FIVB responded with a statement: "We will conduct this debate through the media, but we have all the evidence necessary to verify that the FIVB is not holding the prize money and that the actions were taken at the request and with the approval of [the CBV]. These documents will be presented when officially requested. The FIVB sincerely hopes it is not necessary to reach this point and that the [CBV] retract this totally unfounded accusation." You are going to continue the debate though the media? You are the governing body for the sport! You should be hosting a transparent and open debate in the public to fix all of this! Going back and forth in the papers with crafted press releases is just embarrassing.